Our goal is to ensure that you, the customer, are satisfied with our service. We strive to build long term relationships with our clients. Feel free to call us with all of your exterior cleaning needs. We provide low pressure house and roof cleaning. This is known in the industry as the “Soft Wash” method. This method does not have the same risk as high pressure cleaning on certain surfaces. We use non- toxic chemicals at low pressure to do the work. Clean, dirt-free, commercial buildings are found all over Hilton Head, Bluffton and the Lowcountry, South Carolina. Commercial properties have a professional and clean appearance because of the care given by the building owners. Interior and Exterior Window Washing is a key contributor to the look and perception of every building. We are professional, dependable and efficient in all aspects of our Beaufort Exterior Home Cleaning and Pressure Washing service. We extend our service throughout the Lowcountry with a focus on Beaufort and its surrounding areas down to Bluffton, SC. We are certain you will appreciate our quality and integrity. Sea Spray offers a variety of services designed to dramatically enhance the appearance of both residential and commercial properties. Before initiating work, our professionals will discuss your requirements and offer customized pressure washing or soft clean services for the best outcome. Our house washing services are top of the line. We use low pressure cleaning when needed to prevent damage to your home. We use high pressure on brick or other hard surfaces. Does your roof have black streaks or spots on it? The amount of rain and humidy combined with our warm temperatures allows the algae to thrive in coastal South Carolina. We use professional equipment to clean sidewalks, patio surfaces, and concrete driveways. Sea Spray also offers concrete sealing services. Keeping your gutters clean will prevent water leaking into your home. It will also prevent the damage to your landscape caused by water overflow. Sea Spray Exterior Cleaning did a roof soft wash on my house. They also went above and beyond my expectations by soft washing my back deck and vinyl siding on the back side of my house. Great Job!! Highly recommend! Dave, the owner of Sea Spray, soft washed my house and roof. It looks like a new house. Dave was professional, courteous, and very careful with my plants and bushes. He did a great job and I would highly recommend Sea Spray!!!!! Professional, courteous and provided a soft wash of our home that was above and beyond our expectations. 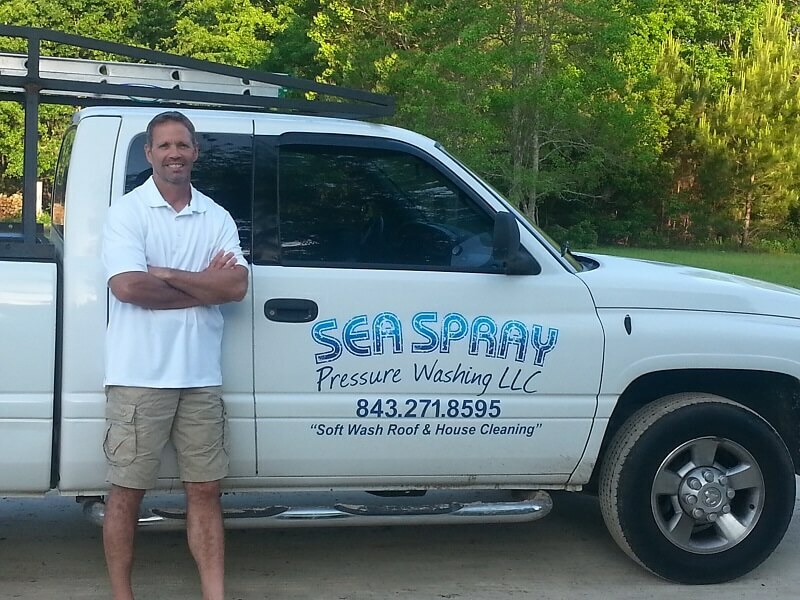 Highly recommend Sea Spray Exterior Cleaning for soft wash, pressure washing and roof cleaning! !